WordPress can embed certain kinds of media content into posts and pages; using the oEmbed protocol. But appearance and usability issues can occur, when this capability is rendered on mobile devices; like smartphones. 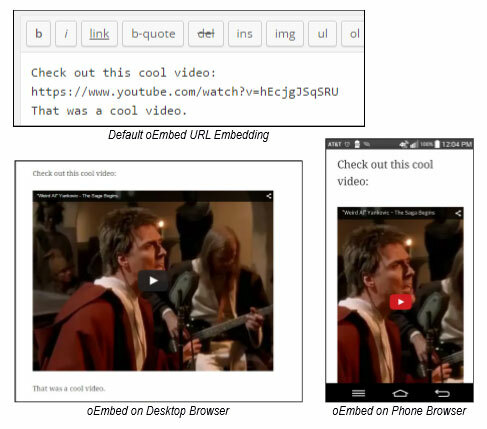 In this example, we see that media embedding can take up much of the phone’s screen, clipping the media horizontally, and that users must scroll to view any surrounding text. Mobile device users should not have to navigate around an oversized media preview. The “width” and/or “height” attributes of the WordPress “embed” shortcode, allows us to resize the media, so that it does not become unreasonably clipped, on mobile devices. Notice there must be no white-space (space characters) between the ends of the embedded media URL, and the shortcode delimiter (square) brackets. The presence of white-space causes the media URL to be displayed as a URL hyperlink, that when clicked, causes a page redirect to the specified media URL. 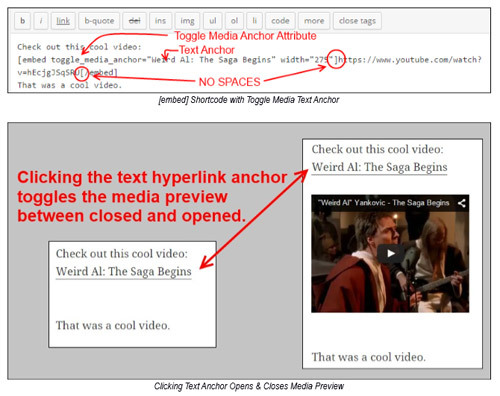 This situation can sometimes be desirable when presenting users with NSFW (Not Suitable For Work), or perhaps (even work related) sight-sensitive, media; in which case the media preview needs to remain hidden, until users are prepared to see the media, hiding behind the URL hyperlink. This however presents its own set of issues. Users are now forced to use the browser’s “Back” button to leave the new page; and they may also be confused by the sudden site re-branding that occurs, when the new page is opened in the same window. Furthermore, the hyperlink is rendered without the benefit of any identifiable context, which may cause users to hesitate before clicking the link. (closed), using a visual toggling effect. To get started; download, install and activate, the WordPress Toggle Media plugin. 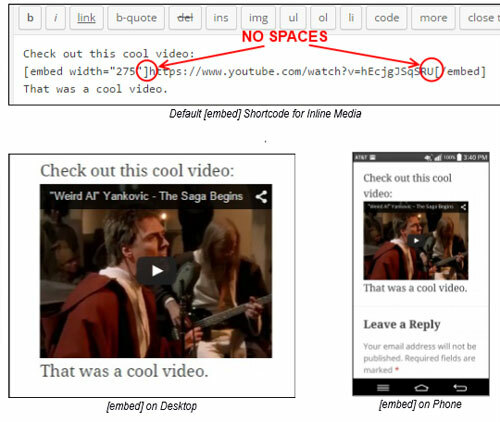 Please note that in the above example, there must be no whitespace (space characters) between the ends of the embedded media URL, and the shortcode delimiter (square) brackets. The presence of whitespace causes the media URL to be displayed as a URL hyperlink, that when clicked, causes a page redirect to the specified media URL. The ability to toggle your media open and close, when used properly, will enhance the usability of almost any site.